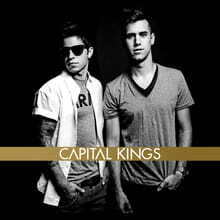 On the same day someone spoke with me about what she perceived as the lack of a Christian club scene, the album review wheel of fortune spun around to this faithfully thumping self-titled debut from Capital Kings. For the pop and hip-hop duo’s sake let’s hope a good number of God’s people do indeed go clubbing, because that scenario would be the perfect fit for this nonstop positive dance music. Executive produced by TobyMac, who also co-writes four of the ten tracks here, Capital Kings is largely thirty-five minutes of savvy Mac-like mainstream hit mimicry—trending beats and production techniques matched with lyrics that usually don’t force feed the spiritual message at hand. Members Cole Walowac and Jonathan White spit intertwining rhymes and melodies somewhat aggressively and/or robotically, so it takes an extra listen before the inherent warmth of the words can seep into the mind. Party starter “All the Way” is programmed to the hilt with flashes of dubstep and a line about how when He comes back He’s takin’ it all the way. Most listeners will bust a lot of moves before the theme of Christ’s return registers. “You’ll Never Be Alone” is the perfect modern radio marriage of Maroon 5 and Owl City, likening a true friend to the GPS when you’ve lost your phone andthe song that’s rockin’ in your headphones. TobyMac is back as hype man on “We Belong as One,” adding some Jamaican essence to the otherwise Mutemath-flavored unity anthem (We belong as one, following the Son). His co-writing shines through further on “I Feel So Alive,” rhythmically and sonically well suited for picking up the pace at a roller skating rink. That gets us back to the best thing about Capital Kings. These guys are a safe cut-loose alternative to a lot of today’s Top 40 stuff that continues to push the boundaries of common decency.